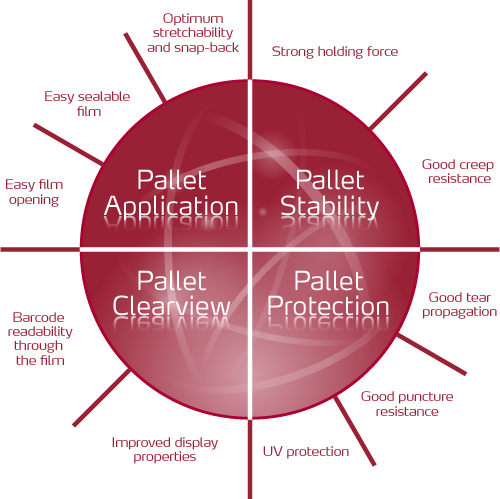 Choose the right pallet wrapping for optimum load stability, transport protection and pallet weather protection. We guarantee the lowest possible price per pallet without compromising load integrity. Stretch hood films are well suited for pallet protection for applications where pallet loads require five-sided protection from weather, dirt, dust, pilferage, etc. Compared with stretch wrapping and top sheets or pallet covers, stretch hood is considerably more effective in protecting the product against rain when stored outside. Stretch hood provides a clear view of product name and logo, which improves the branding of the product. Elimination of condensation with Lachenmeier patent pending Xeros® technology. Stretch hood machines and stretch hood film work together as a system. Each part is equally important for a consistent high quality packaging operation with high performance and low operating costs. Lachenmeier combines our extensive knowledge of stretch hood films with our wrapping equipment to eliminate any incompatibility issues, and to ensure the best packaging quality at the lowest cost. Our films are designed with the optimum balance between elastic properties and holding forces, which is critical in obtaining the right load stability. Further, Lachenmeier films are designed with the optimum COF and modulus for best performance on the Lachenmeier equipment. Be sure to use the right film - get a FREE pallet wrap audit!